316 Port Douglas Road, Port Douglas QLD 4877 Australia. Reception: 24 hours, 7 days. A revitalised beachfront luxury resort on famous Four Mile Beach surrounded by 147 hectares of lush tropical gardens, 2 hectares of sparkling saltwater lagoon pools and an 18-hole golf course, 5-star resort amenities and service to make you feel at home in paradise. The UNESCO world heritage listed marvels, Great Barrier Reef and Daintree Rainforest await to take you on the adventures of a lifetime. The newly transformed 5-star rooms and suites afford captivating views of the lagoon pools, tropical gardens or select rooms feature private balconies. Representing the resort’s fresh beachside nature and inspired by the tropical north Queensland lifestyle. Exquisite dining venues provide scrumptious delicacies including fresh seafood in the comfort of the resort. Family-friendly facilities include our large swimming pools, special Kids Pass and our Tour Desk ready to make your child’s dream adventure come true. Swing by the 18- hole golf course or explore any of our country club offerings for first-class sports facilities. 17 indoor and outdoor venues including our stunning beach and tropical gardens will make the perfect backdrop to your corporate meeting or enchanting wedding. Our location on picturesque Four Mile Beach and proximity to the reef and rainforest have put the resort at the top of many lists on where to stay in Port Douglas. Port Douglas Peninsula Boutique Hotel where tropical luxury awaits. This boutique style hotel experience boasts an unrivalled beachside location overlooking Four Mile Beach and is the only hotel in Port Douglas with beach and ocean views. 40 metres to the beach and a 2 minute stroll to the heart of Port Douglas with its cosmopolitan boutiques, restaurants and entertainment options. 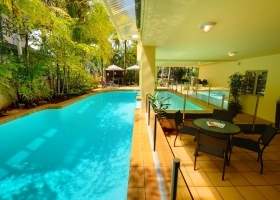 Situated in Port Douglas, one of Tropical North Queensland’s most desired holiday destinations, Oaks Lagoons stands among the best and most affordable Port Douglas hotels, combining deluxe accommodation, a range of leisure facilities and easy access to the magical Great Barrier Reef and Daintree Rainforest, making it the perfect holiday destination. Spacious and stylish accommodation options range from hotel rooms with large corner spas, to self-contained one and two bedroom apartments complete with fully equipped kitchen and laundry facilities. Deluxe suite suitable for couples and couples with small children located at Ramada Resort. Set amongst a tall lush Melaleuca Rainforest, with lily pond and streams, the resort has just finished a multimillion dollar makeover including a stunning new paint job and new wicker resort furniture around the pool and in the restaurant and new decking flowing from the front through to the pool. 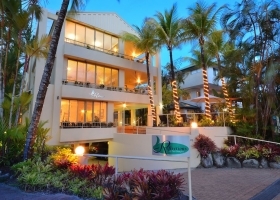 The spacious, light-filled and comfortable Port Douglas accommodation includes well-equipped and air-conditioned hotel rooms that provide a perfect haven to relax and recharge. All accommodation is themed with natural colours and plantation shutters, designed to complement the natural surrounds of the resort. The resort’s picturesque rainforest gardens are quite unique. Large barramundi can be seen in the free-flowing waterways and lily ponds, while Ulysses butterflies flutter throughout the gardens. 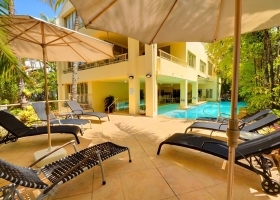 Ramada Port Douglas's facilities include a tropical lagoon-style pool with waterfall and swim-up bar, which provides guests with the ideal holiday setting to relax and unwind. Open daily for breakfast, lunch and dinner, the onsite Tree Bar and Grill restaurant overlooks the pool and provides a relaxing and casual dining experience. There is also a tour desk at Reception to book activities and attractions in the region, plus conference, meeting and wedding facilities, catering for up to 80 guests. The spacious, well-appointed holiday accommodation and modern resort facilities make Ramada Port Douglas the perfect resort for a Tropical North Queensland getaway. 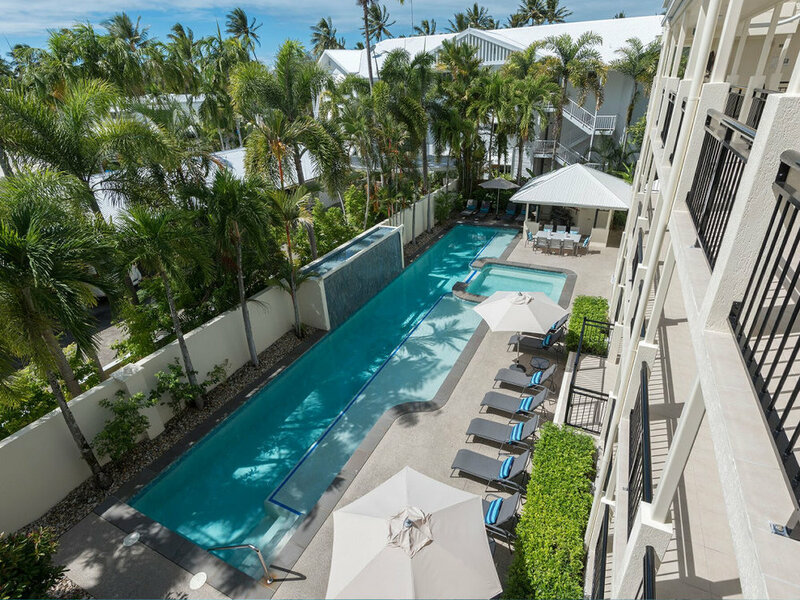 A Tropical Escape awaits you at Verandahs Apartments Port Douglas. The Newport on Macrossan Street is a family run business that believe a holiday is all about escaping stress not adding to it, we provide Port Douglas Accommodation that will let you wind down not up. Conveniently located in the heart of Tropical Port Douglas, we provide clean, comfortable and contemporary holiday accommodation at a great price. We offer a great location, excellent value for money along with friendly service which keeps bringing our guests back year after year. Port Douglas is the ideal place to wind down and escape from the stresses of city life, it offers a chance for a holiday experience like nowhere else in Australia. With some of the best tours in the country operating out of Port Douglas both to the Great Barrier Reef and the Daintree Rainforest, we also have excellent restaurants and the fabulous Four Mile Beach all in a tropical setting with a friendly village atmosphere. Convenience is such a large part of what makes Port Douglas and in particular The Newport on Macrossan an ideal choice for your relaxing break away. Welcome to Ulysses Getaways, your Port Douglas luxury holiday home specialists! Beach houses, villas, holiday houses and luxury apartment rentals in and around Port Douglas. We are privileged to present to you and your family the ultimate in luxury and superbly equipped holiday accommodation. Ulysses Getaways boasts the unique combination of stunning Port Douglas holiday properties, exceptional service, a great location and the benefit of local knowledge.